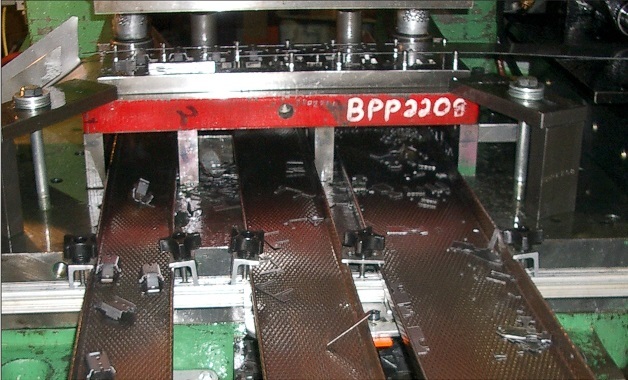 All chutes or trays are made of 22g, 304 stainless steel with a special embossed pattern. Please contact us for a quote on a different gauge of SS or for CRS. Conveyance speeds are up to five times faster than with a smooth surface, particularly when parts are oily. 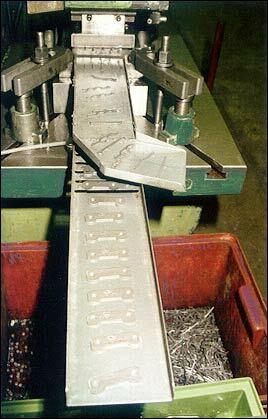 All chutes are fabricated based on inside dimension unless otherwise indicated. One inch (1") high sidewalls are standard. Additional charges apply for larger than 1" high sides. Sides can be "flared" in the field to fit slightly wider spaces. In those cases, customer will need to modify the height of the toe clamp themselves to fit their requirement. Up to 1/2" can easily be gained by bending or flaring the sides to fit. Avoid rubbing sides of parallels. Chutes longer than 60" will require crating for shipment to avoid bending and buckling. Additional crate charges will apply. Entire systems including chutes/trays generally ship within one week and often less. For information on how to order chutes, download The Chuter Brochure. Or contact us at (317) 245-4040 or admin@productivityresources.com.